Many people die in accidents that involve pedestrians and cars. 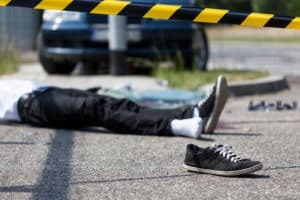 These accidents can have one of several liable parties – the pedestrian, the car driver, or the government entity in charge of maintaining that particular area of highway or roadway where the accident happened. Phoenix pedestrian accident attorney Nathaniel (Nate) Preston has a proven track record of successfully representing victims of accidents. He will put his skills to use to help you recover the compensation that you deserve. Both drivers and pedestrians must follow traffic regulations so accidents can be prevented. Drivers and pedestrians are required to exercise due care when they are out on the road, either walking or driving. Failing to exercise due care is considered negligence and is unlawful. Therefore, you need to use caution when you are out on the roads, regardless of whether you are driving or walking. injuries he or she incurred as well as any expenses or injuries suffered by the driver. The pedestrian could be liable for medical costs, lost wages, pain and suffering, and any property damage. There are many reasons that a pedestrian could be at-fault for the accident. Examples of these reasons include – jaywalking, ignoring a don’t walk light at a crosswalk, improperly using crosswalks, and darting into traffic and jumping in front of cars without warning. What Should I Do If I am in a Pedestrian – Auto Accident? If you have been involved in an accident, call the police. If there are injuries, call an ambulance if one is needed. You should then call your insurance company to report the accident. You shouldn’t take responsibility or admit fault for the accident. Don’t leave the scene, and get the names and contact information for any witnesses. Never give an insurance company a written or recorded statement. Dedicated to helping his clients get the compensation they deserve, Nate will ensure your rights are protected and fight for you. Your free consultation is completely free of charge. You won’t pay Nate a cent unless he recovers compensation for you first. If you or a family member has been injured in a pedestrian accident in Phoenix, contact Nate today to schedule a free initial consultation for your claim by completing the online form or by calling Nate’s office at 602-652-2009.